Sunset kiteboarding session at East Bay. Professional kiter Hope LeVin off South Caicos. See the current wind forecast. 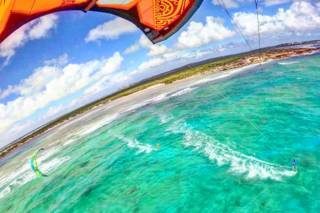 South Caicos is an exceptional destination for the competent kiter. There are tremendous landscapes to explore, much of which rarely see visitors. When the wind isn’t quiet blowing, there are quite a few other outdoor activities and sights to occupy your time. There are two way to get to South Caicos from Providenciales (where all scheduled international flights land): domestic flights on small twin-engine planes, and a passenger ferry service. The flight is generally the easier means of transport, but depending on how much gear you’ll be travelling with, you may want to consider the ferry. InterCaribbean is the only airline with regular flights to South Caicos, and they tend to have very reasonable overweight and oversize baggage fees. However, a large group with kite equipment may be better off making the journey by boat. Kiting at the East Bay Resort. 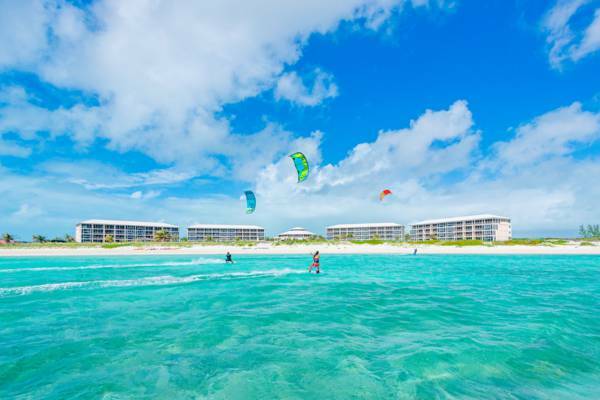 The following are the best kite spots on South Caicos. 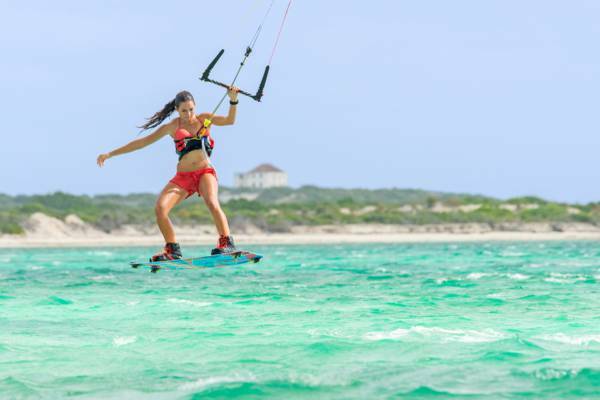 East Bay typically offers the best conditions for kiteboarding on South Caicos. The consistent trade winds will generally be on shore here, access is convenient, and due to the adjacent East Bay Resort, if you run into difficulties, you’ll be most likely to receive help here. The depth of the bay ranges from 3-6 feet (1-2 meter) near the beach and sheltered eastern shallows, to up to about 16 feet (5 meters) in the deepest sections of the bay. A barrier reef protects the area and creates a bit of a break at times. The waters off Cockburn Harbour and Long Cay are also within kiting distance, be aware of the difficulty of making your way back up wind. For those looking for a bit of flat water, the shallow and spectacularly turquoise Bell Sound Lagoon is a great location. This spot is best when the winds blowing a bit more from the south as the high hills above Long Beach (Sailrock East Beach) and Valley Bay can cause disruptions. A decent launch point is found northeast of the South Caicos Airport (XSC). The road leads directly on to a small silty beach, which offers just enough space to set up. Long Beach (Sailrock East Beach) lines much of the central east coast of South Caicos and is another site to consider. Wind will typically be a bit more side-on here, but the greatest detraction is simply the lack of beach accesses. The far northern point of South Caicos, Plandon Cay Cut is a tremendously scenic region of small cays, colorful channels and sand bars. Due to the typically side-on wind and low limestone bluffs, this area can be a bit tougher to launch from compared to other sites. As a very quiet island that doesn’t see many visitors, kiteboarding support options are limited. Big Blue Collective, based on Providenciales, does operate water sports adventures to South Caicos. Equipment rental, instruction and kite safaris can be specially arranged. South Caicos isn’t a great spot for beginners due to the seclusion and lack of resident instructors. If you’re starting the water sport, you can’t do better than the perfect conditions of Long Bay Beach on Providenciales. We recommend exploring with a knowledgeable guide if you intend to visit remote areas. It makes sense to discuss possible locations with a water sports business familiar with the island as weather conditions vary. As is the case at most locations on South Caicos, you will probably be on your own if you run into difficulties due to the seclusion. Be aware of wind and currents. You may have problems kiting back to your launch point.